Stainless steel case with a stainless steel bracelet. Fixed stainless steel bezel. Mother of pearl dial with silver-tone hands and diamond hour markers. Quartz movement. Scratch resistant anti-reflective sapphire crystal. Screw down crown. Solid case back. Case diameter: 27 mm. Push button fold over clasp. Water resistant at 100 meters/ 330 feet. Functions: hours, minutes. 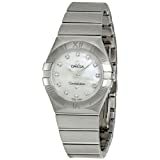 Omega Constellation Diamond Ladies Watch 12310276055001.